Kentia Palm Tree (Howea Forsteriana) is the classic indoor palm, slow growing and elegant, and easy to care for. It is a hardy palm that adapts well to the indoor environment and tolerates low light and low-humidity conditions. It is native to Lord Howe Island of Sydney, Australia; likes a well-lit location out of direct sunlight. These plants are very popular with decorators adding an instant attraction to the decor for entryways, office buildings, hotel lobbies and shopping malls. The large kentia palm trees with long graceful, dark green fronds are perfect for a beach scene. They are certainly the most elegant potted plants to use to create your tropical paradise. Add some wicker or rattan furniture, some beach accessories, a painting or wall mural of the beach, and you will have the right setting. Plus, a water fountain or aquarium to provide the tranquilizing sounds of flowing water. This will induce those calm, soul-soothing feelings of being on the beach after a long, stressful day. Be sure to let in plenty of light. It will remind you of happy times of summer, warm you up and lift your spirit even when it's cold and dreary. This plant makes a great choice for a gift for any occasion. They are durable, slow-growing exotic specimen which make very versatile houseplants as they come in all sizes suitable for most situations within the home. They are forgiving of general neglect and they provide good air quality. The Kentia palm makes a great centerpiece for tables and countertops in family and living rooms, kitchens and bedrooms. It is also low-maintenance, thrives in low light, and easily tolerates the warm and cool air conditions in the home environment-- yielding the added health benefits of clean air in the home. Light: Low to medium (near a bright window) but avoid full sun. Watering: Water thoroughly, then allow the soil to drain and empty excess water; then allow the top one inch of soil to dry slightly to touch between waterings. A well-draining potting mixture should be used. This is necessary to prevent root rot which can kill your plant. Reduce watering in winter and mist regularly. Humidity: Use a room humidifier to protect plant from dry air. This will keep the air moisture elevated when used with heating and cooling systems. Fertilizer: Fertilize during the growing season with a granular, time-release fertilizer or you can apply liquid plant food from April to September. Avoid excessive fertilizer, as it may cause the tips of lower leaves to turn brown and die. Soil: Use fast draining potting mix, preferably on the sandy side. Propagation: Propagate by seeds, offsets, or division. Pruning: When you see leaves start to turn yellow or brown and wilt, use pruning shears to remove these leaves at the base. Palms, in general, require minimal pruning. Pests: Check for spider mites and scale on the underside of leaves; if present, spray with appropriate pesticide. You can also wash leaves with a soapy solution to lessen the presence of mites. 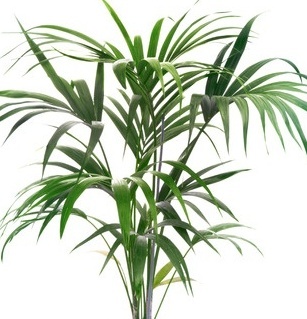 With proper care, your Kentia palm tree will reward you with vibrant, dark green, eye-catching foliage for many years.